At the end of the Great War, the Keisers’s high seas fleet was interned at Scapa Flow, Orkney. Due to some miscommunication or maybe the lack of communication, Rear Admiral von Reuter ordered the scuttling of the entire fleet. Most were removed straight away, except some of the vessels that were in deeper water, several were then salvaged. Most of the German U-Boats, in UK waters went to Harwich to surrender as well as some other ports, receiving various fates over the next few years. Some of the surrendered U-Boats, were dispatched to Falmouth. The story that went around and even appeared in several books, was that they were sent to Falmouth, for gunnery practice. They shot at and sank three of them, the rest blew ashore during a south easterly gale. This story was believed to be true for a long time, we have no idea where it came from but it sounded feasible. Then one day I thought “Why would anyone tow a flotilla of submarines to Falmouth, just to shoot and sink them? That could be done anywhere, not towed hundreds of miles at great cost.”. There was also an issue of the submarines blowing ashore, one was supposed to have gone in at Gyllyngvase Beach, which is on the west edge of Falmouth Bay, the rest ended up on Pendennis Point, to the north of the bay, this did not make sense, so we decided to look into what actually happened. Information is constantly coming forth, this is the factual information as we know it as of May 2018. The exact reason why any were sent to Falmouth does not seem to be documented too well, we do know they were coming for explosive trials. There are also misleading reports about the actual number sent, somewhere between five and nine. On November 23rd 1920, a report in a newspaper stated “Experimental submarine sinks”. The story stated that an aft panel had become loose on one of the U-Boats, SM (Seiner Majestät, His Majesty’s) UB118, it started taking on water off of Dodman Point. It then created a lot of drag and the tow broke. Knowing that it would continue to break it’s tow with the extra weight of water now inside, it had to be sunk as it would be a danger to shipping if left. It was going to be easier to sink it than try to bail it out and restart the tow. The auxiliary patrol vessel ‘Kennet’, fired on UB118 and sank it. 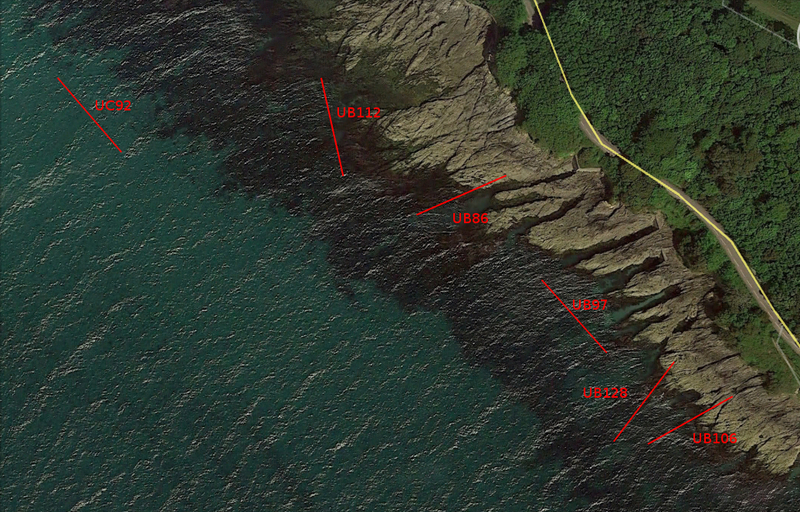 There are two U-Boat wrecks listed near Dodman Point, UB113 and UB118. UB113 was on patrol when lost according to official records, UB118 was part of the convoy to Falmouth. Whether UB113 is actually there, is another project for the future. The remaining U-Boat flotilla ended up moored in Falmouth Bay, awaiting whatever their fate would be. Naval records stored within the National Archive, state that they were used in explosive experiments, to test for weaknesses in their construction. 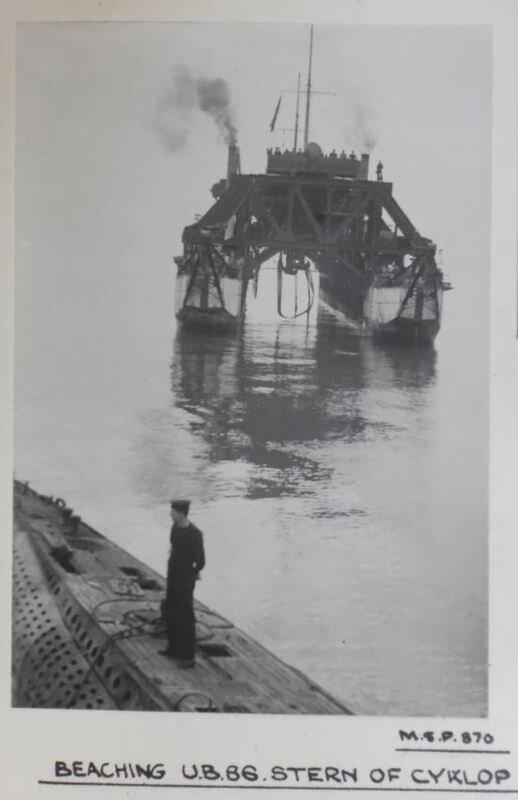 A huge twin hulled submarine lifting rig, the steam powered ex-German submarine support vessel, Cyklop, carried the subs out into deeper water, lowering them down to the required depth. Trial 4 stated that UB106 was at a depth of 100ft, in 22 fathoms of water. A net mine with 45 lbs of Amatol was placed 6ft off the port beam. The charge was set off, the sub was then recovered and inspected for damage. Trial 4 completely filled the sub with water, the bow was bent to starboard, straining the bow tubes causing them to leak. At the end of the tests, they were dropped off close to the rocks on Pendennis. 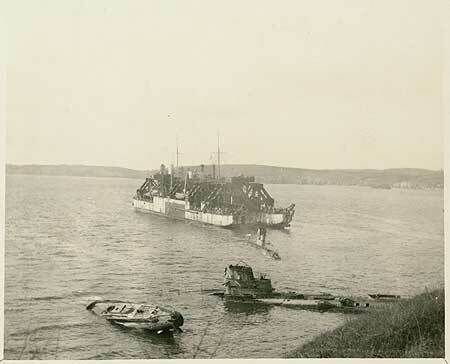 Within the National Archive, there is a photo of UB86 and the stern of Cyklop, captioned “BEACHING U.B.86. STERN OF CYKLOP”. They were then manually hauled up onto the rocks, below the castle. Another photo shows around twenty men on the shore leaning back, with the caption ‘UB-106 being hauled ashore’. The angle of the rope lines up with the remains of two metal spikes sticking out of the rocks, quite likely where there had some pulley blocks to help with the task. It is believed they were beached as and when they became too damaged to withstand another trial. UB97 had to have barrels strapped to it’s bow to help it float, before it was beached. What we do know is that on December 16th 1920, UB112 appeared in a newspaper stating that this U-Boat was ashore. The newspaper piece also stated that experiments were expected to continue after Christmas. Trial 4 stated above, is dated 17th January 1921, so they did return. 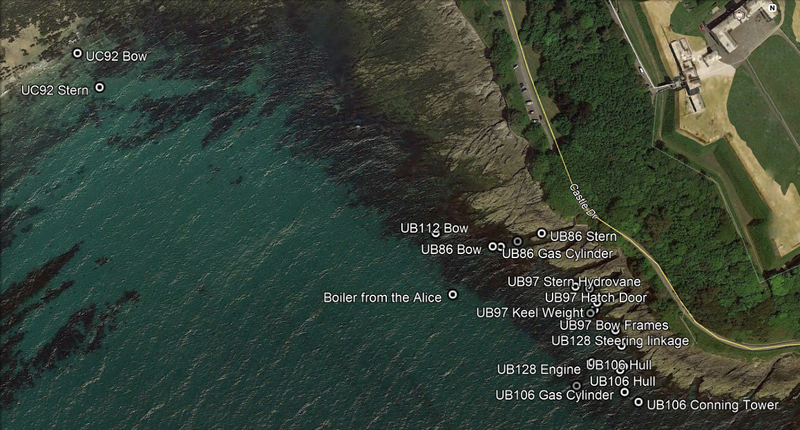 The official records stated that UB86, UB97, UB112, UB106, UB128 & UC92 arrived at Falmouth, so six in total. We have photos of five on the rocks, backed up by a newspaper article dated April 2nd, stating there were five U-Boats on the rocks. A few days earlier on March 28th, another newspaper article showed UB112, with a conning tower just sticking out of the water behind it. That makes six submarines. Over the years, many photos were taken of the submarines. Most offered no clues as to what they were. One photo, from an unknown source, shows a U-Boat in a gully, with it’s stern out of the water. On the side of the conning tower, it’s markings of UB86 are clearly visible. Quite a bit of that submarine remains underwater today. 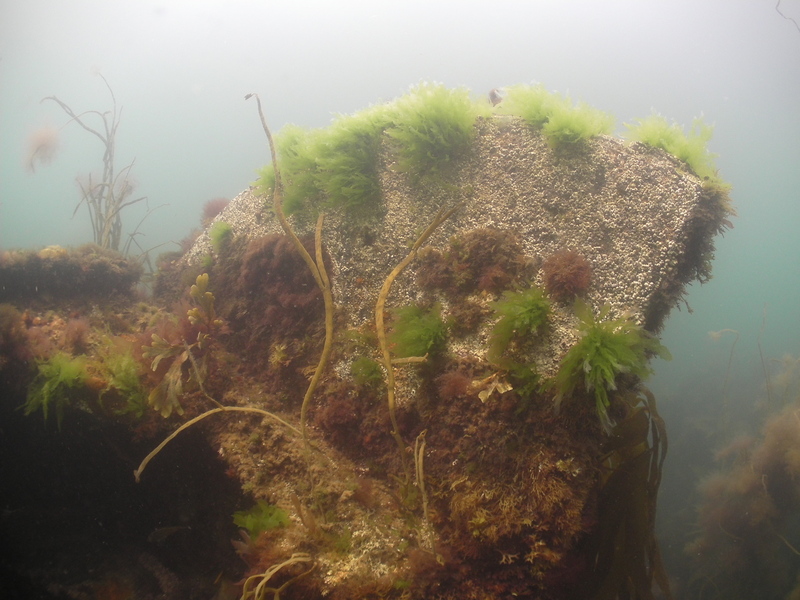 On a very low spring tide, some of it is visible from the surface. 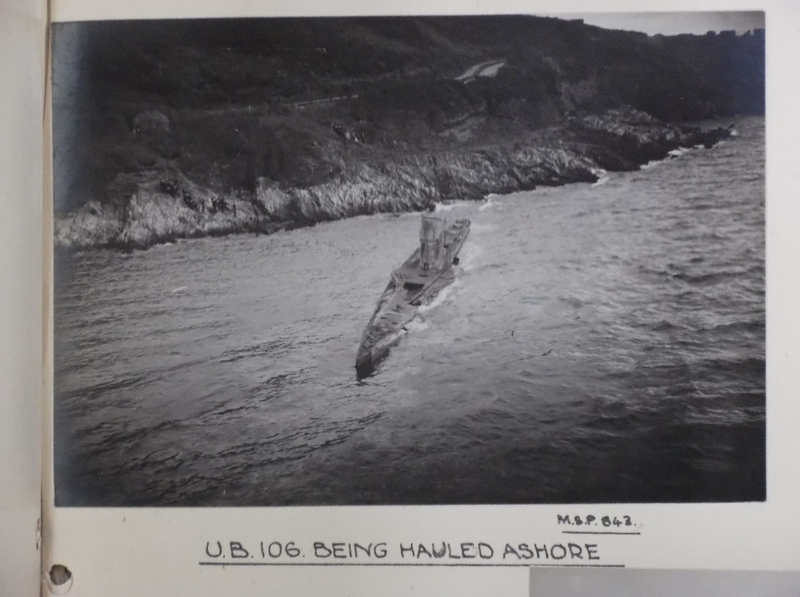 A lot of the contemporary photographs showed both UB86 with another submarine close to it. Within the records at Historic England, they have a collection of photographs, taken by a British Naval submariner of the time, Jack Casement. There are also copies of these in the National Archive. They are of UB86 and another submarine, one of the H.E. photos shows the markings of that submarine, UB112. There are some remains of this submarine left today, although most of it lies flat and close to the sea bed. Divers notice a large three pronged fork, which is the highest point of the wreckage that remains. It is thought to be part of the hydro-vane’s mechanism. A little further east of these two wrecked submarines, there are remains of three more. Most of the time the remaining bits of these lie hidden under the sand, only becoming occasionally exposed after a storm. These are virtually impossible to identify as submarines underwater. 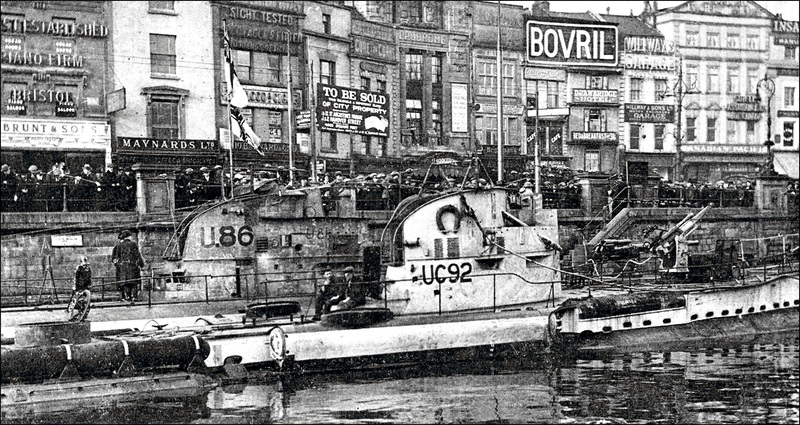 One is UB106, according to an excerpt from the National Archive and the photograph of it being hauled ashore. There are two submarines next to it, so far not known as well as the sub in deeper water. The sub that is now on Castle Beach, was not on Castle Beach at the time. It was hauled there later and salvaged. The subs on the rocks underwent a lot of salvage over the years, it would have been a major job to drag one of them off and onto Castle Beach. So the logical answer would be the sub in deeper water behind UB112, so this was most likely UC92. This leaves the two subs between UB86 and UB106, one is UB97 and one is UB128. Historic England have a photo showing the side of the conning tower of the sub next to UB106, it reads UB128, which leaves the middle sub to be UB97. A newspaper article dated June 1921, states that the Steam Tug ‘Alice’, owned by a Mr W. S. Pearce, sank on it’s mooring one night near Pendennis. Alice had been involved in salvage operations on the submarines when it sank. Wessex Archaeology spent two days in July 2013, investigating the Castle Beach site, taking photos etc. I assisted and even revisited to go and take a couple of extra measurements for their official record. There are six circular features near the shore end of the sub, measuring 1m in diameter and 9m from front of the first to the rear of the last. This was the last piece of data required to determine that it is in fact UC92. The six circular features are the mine shafts, UC92 was the only mine layer of the six submarines. Records state UC92 was lifted in 1971 and scrapped, it looks like it wasn’t lifted, just dragged up onto Castle Beach to be scrapped. The date of 1971 is a bit suspect, on a postcard dated 1957, the remains of UC92 can be seen. The stern now lies at 50.147027, -5.055695, the bow at 50.147299, -5.055984, it is visible on Bing maps or Google maps. On a low spring tide, the bow is visible out of the water. The U-Boats were sold to Messrs R. H. Roskell and A. Rogers in March/April 1921. 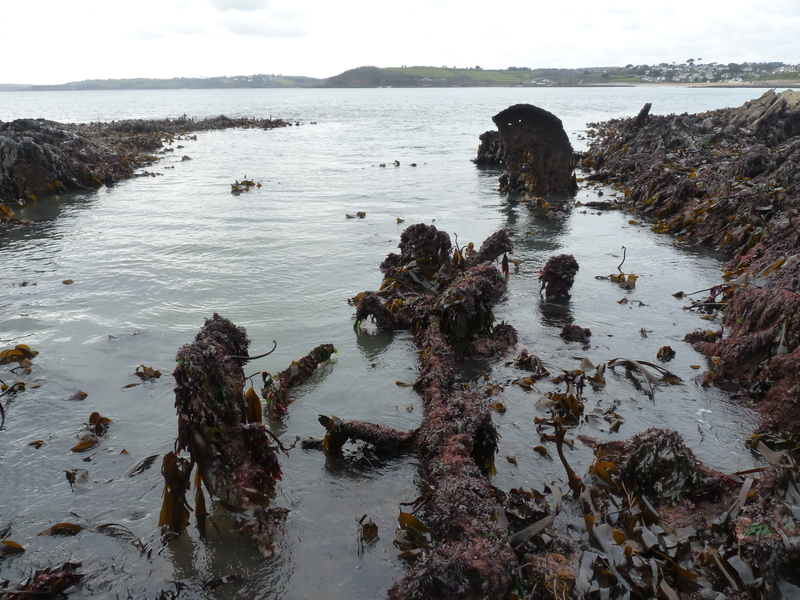 Over the years the Falmouth U-Boats have had a hard time. They were gradually broken up and salvaged, even the ex-mayor of Falmouth, a Mr C. A. Chard, was over-seeing salvage work during 1938. 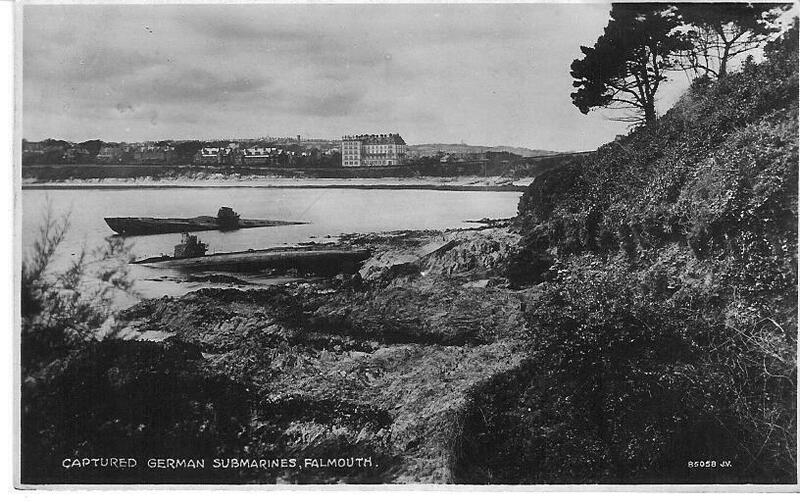 In Roland Morris’ book, “Island Treasure”, he mentions the Falmouth U-Boats. In it he states – “Many years ago, I cut up several ex-German submarines. These were the small First World War U-boats of about 800 tons and they lay about on the rocks at Falmouth like a flock of stranded whales. Many years after, a bather gashed a leg on an underwater projection in the vicinity of these wrecks.”. Another story states that whatever was left, was then possibly flattened by George Renton in 1966/7. A local diver, who worked for Risdon Beazley, states that they salvaged these submarines around 1969. He also stated that they dragged one of the U-Boats off Castle Beach and dropped in onto the N.G. Petersen wreck site. Although there is no evidence of this, there are the remains of a large electric motor within a few metres of the Petersen. The motor is of a very similar size to that of a U-Boats, there may be more remains of whatever U-Boat this was, we will look into it more. Contracted by the Navy or maybe by the Harbour Master, George or whoever it was, did a fine job of flattening the remains. Details within the National Archive “Explosive trials on German submarines: 1921“ ref:ADM 189/102, are held at the National Archives, Kew. From newspaper clippings we know the U-Boats would have arrived around November 23 1920. By December 16, just over three weeks later, UB112 was on the rocks. The trials continued after Christmas 1920 into 1921. With newspaper reports from March and April showing all the U-Boats on the rocks, plus the salvage being under way in June, experiments never continued for very long. Therefore, the U-Boats were only experimented on for a very short period of time, completing 17 explosive trials. There may have been more U-Boats, we may find out one day. What has been reported as other U-Boats may just be pieces of some of these U-Boats that fell off after the trials. The Maritime Archaeology Trust have completed a report on the U-Boats, it can be viewed via THIS page.